Full of enticing, authentic and, most of all, quick-to-prepare recipes, Gennaro Contaldo's new book demonstrates how to whip up a delicious Italian feast in 40 minutes or less. From lightning-fast risottos to perfectly pronto pastas, speedy soups and delightful desserts, these recipes showcase the very best Italy has to offer, while requiring very little time in the kitchen. Featuring food from all the major regions of Italy, these quick recipes really make the most of the amazing fresh produce for which Italy is renowned. The result is delicious, nutritious food that can be on the table in minutes - perfect for busy families or for easy entertaining. Beginning with a handy guide to keeping your Italian larder full of the best ingredients to whizz up a speedy supper, the book is split into sections covering Soups, Salads, Pasta, Rice, Meat, Fish, Vegetables, Sauces and Desserts ensuring that you have a wealth of recipes at your fingertips. From lemon-infused steam-baked mackerel to classic pasta recipes and quick chocolate raspberry pots you can impress friends and family with a stunning menu in minutes. 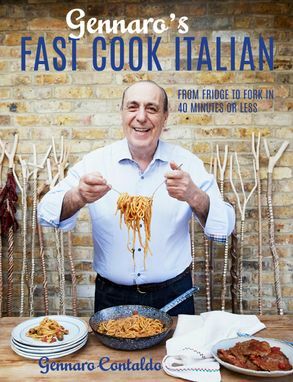 Gennaro Contaldo was born in Minori in Amalfi. He came to Britain in the late 1960s and worked in several restaurants around the country and in London,where he eventually opened the award-winning Passione. He came to public attention as the chef who inspired Jamie Oliver when they worked together atAntonio Carluccio's Neal Street restaurant. In Spring 2011 he co-presented Two Greedy Italians on BBC2 with Antonio Carluccio and in spring 2012 a secondseries, Two Greedy Italians Still Hungry was broadcast. He is the author of several cookbooks, including Let's Cook Italian, Gennaro's Italian Year andPassione.